These can be included and/or modified as desired. $count - a count of identical components - grouped into a single line. $comp_desc - the description stored on the component definition. $iname - returns the instance name, or blank if not set. $iname can be set on for edit - if yiou change $iname for an instance the new name is stored directly on the Component Instance or Group. $layer - the layer of the component. These are attributes you add to system. These are any attributes found in any Dynamic Components in yout model. The are preceded with DC to identify them. Some attributes, such as DC: lenx are set to the value of the nominal in the Dynamic Component, (e.g. _lenx_nominal),. This is not necessarily the actual size of the component, but is used to calculate the size of geometry in the component. You can add additional SpaceDesign attributes using the Add Attribute button. After entering a name and clicking OK, you the Edit Attribute Dialog will be loaded to make changes. These are available on the attribute spreadsheet, and the Edit Attribute dialog. Extend From - calculate this field by multiplying another field by the Count field. Multi Line - attribute text contains carriage returns. Skip if True - component is not displayed in report if this attribute is true. Allow Report - Attribute is used for reporting. Allow Viewing - Will be viewed on the Edit dialog, but cannot be changed. Allow Editing - View and edit on the Edit Dialog. Suppress from Report - attribute is used to calculate other fields for the report, but does not display directly on the report. Add %attribute% to calculation - adds a reference to an existing attribute to the calculation string. List in Attriubute - this attribute will be listed in the other attribute selected. Prev - save changes and navigate to the previous attribute. Next - save changes and navigate to the next attribute. 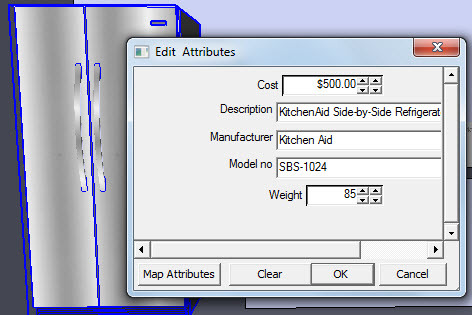 Calculations - setting attribute values based on size of components, or other attributes. Area - report on the area of a face in a component. Length - report on the length or curves or edge lines in a component. List Attributes - creating a list of attributes and settings. Filtering - filtering which attributes to include in report. Select Entities by Attribute - search for words, phrases or patterns in attributes. 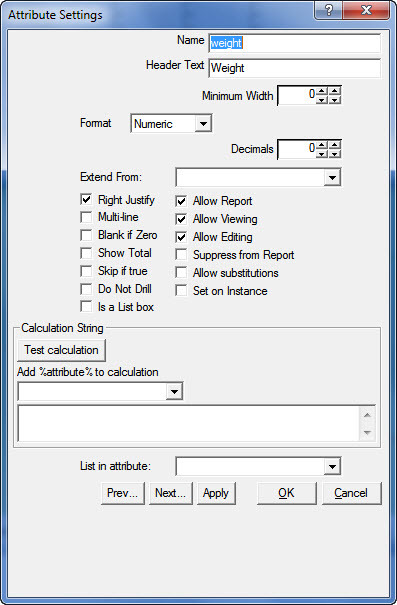 Auto Generate Attributes - define and edit attributes in an excel spread sheet.